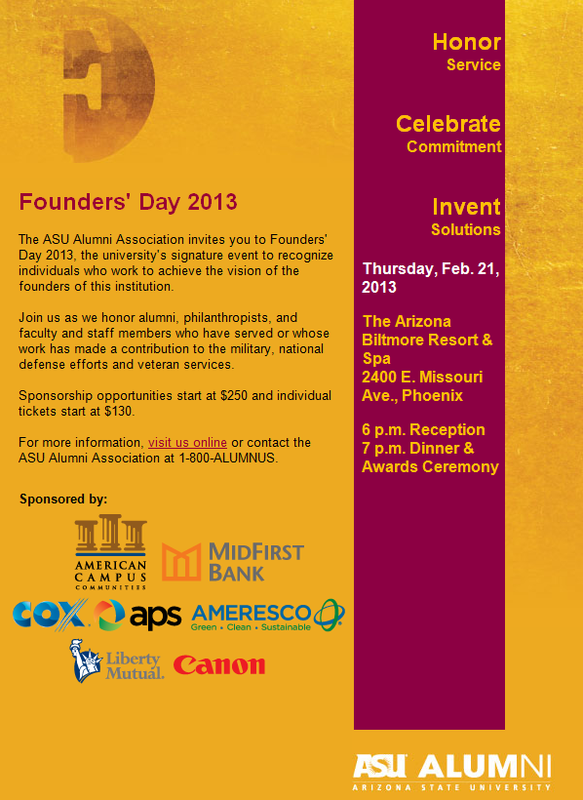 The ASU Alumni Association invites you to Founders’ Day 2013, the university’s signature event to recognize individuals who work to achieve the vision of the founders of this institution. Join us as we honor alumni, philanthropists, and faculty and staff members who have served or whose work has made a contribution to the military, national defense efforts and veteran services. The event will feature some of the highest ranking Sun Devil military officials, generous contributors to campus military and veteran services, research and compelling narratives from ASU faculty members, and stories of service from ASU staff. Founders’ Day, Arizona State University’s signature event, brings together university leadership and influential business and community members to celebrate ASU’s successes and recognize members of the ASU family who continue to perpetuate the growth and diversity envisioned by the founders of this institution. Register online at alumni.asu.edu/events/founders-day/registration by Wednesday, February 13, 2013.